This year Vladimir Putin's annual address received particularly much attention: the leader of an aggressive state with declining economy was presenting his vision, a state that is a real headache to anyone who has to deal with it. In Russian, this address is called "poslaniye", and it means more than just a report or a speech. In the Russian translation of the New Testament, "poslaniye" refers to the Apostle letters. In Russia, the tradition to make annual addresses and its title was introduced by Boris Yeltsin in 1994. Each year the US president goes to the legislators to report on the „State of the Union“ - this is how his speech is called. Presidents of the Republic of Lithuania also make annual reports – not the homily – as a guest of the legislators in the Seimas (the Parliament). In Russia, the opposite is true, it is the members of the Duma who are going to the uberrima to listen to the "Letter to the Corinthians". The Russian federal television called this speech a "letter from the above" (in Russian: poslaniye svyshe). It is hardly a joke, since, if suspected of mockery, the snappy TV people would be immediately beheaded. It is rather a confirmation that the annual address shall be viewed as the Word of God on earth. This year, first time since 1994, the administration of the Russian president did not ask the Government to help prepare the letter. Despite the fact that the country is in a difficult situation, there was no public debate about the policy guidelines that Putin should give in his speech. There were rumours that two versions were scripted: a stricter and a softer one. Experts who contributed to the speech blurted behind the scenes that taboo topics were clearly pointed out to them: the political model, the courts, law enforcement, and inter-regional relations. Such restrictions remind a lot of the attempts of the collapsing USSR to salvage itself by declaring certain core problems off-limits: private ownership, status of the Soviet republics. At the end of the day, necessity anyway brought them up on the surface. One cannot say that Putin is not learning from mistakes. When the country was starving and freezing after the war, in February 1946, Stalin made a statement that the population should be patient for 10-15 more years. Winston Churchill responded to it in March, when he was in Fulton, by saying that the USSR was becoming a military economy with impoverished citizens and powerful army. The Iron Curtain descended on Europe after his speech. The Cold War was lost by those who promised to save the entire world by turning it into the World Empire. This year the word "freedom" in Putin's speech was uttered unusually often. However, he admitted that he was not ready for an arms race. The soft version of the speech was delivered. Though it was not really Stalinist, but it was no less aggressive. It was comprised of two parts: ideological and economic. 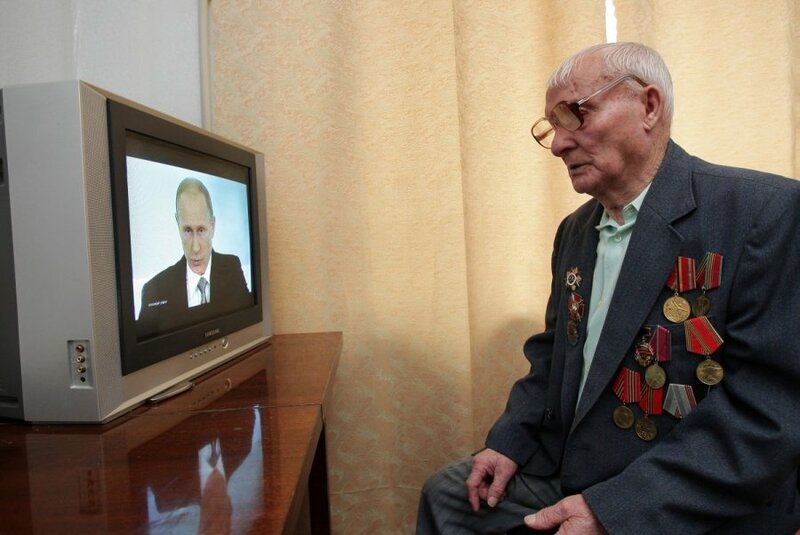 Judging by the delivery, one felt that ideological issues mattered to Putin more. According to Russian political scientist Stanislav Belkovsky, additional 2.5 pages of text were added to the speech. Most likely, they contained Putin's most sacred thoughts on Russia's place in the world. A general picture is as follows: Russia is surrounded by enemies; as soon as the nation tries to stand on its two feet, the enemies do everything to bring Russians down again. It has continued this way for ages. The last year has shown that Russians are now a mature nation. Recall that the highlights of the year included the annexation of Crimea and attack on east Ukraine. This is how the president of Russia understands maturity. He is very angry that the West does not agree with his right to behave as he wishes. He is ready to fight for this right. As the Western powers are trying to stop Russia's aggressive and dangerous policies in the world, Putin compares the West to Hitler. Before, fascists had been only in Ukraine. Now the USA is also in the same category. Russia's strength lies in its spiritual foundation. Putin presented a new excuse for the occupation of Crimea: it contains the site of the ancient Byzantine city Chersoneses, where Duke Vladimir was baptised and later spread Christianity among Russians. Although the Russian Orthodox Church never considered it as a sacred site, the president proclaimed in a biblical tone that Crimea "henceforth and forever" will be the nation's source of spirituality. Duke Vladimir showed his spirituality to Chersoneses when the city surrendered to him after the siege: he raped the daughter of the city ruler, in the presence of the captured ruler and his wife. But this thousand-year-old story has nothing to do with Moscow – Vladimir was the Duke of Kiev and he baptised his people in Kiev. His portrait has been put on the Ukrainian hryvnia and not on the Russian rouble. References to spiritual source in Crimea reminds one of Mussolini's rhetoric when fascist Italy attacked Abyssinia, another member of the League of Nations. Back then, the Duce told that there were historic Italian roots and that Julius Caesar and Augustus Octavius were walking on that land. We can imagine how Italians would react today to talks about sacred Ethiopia and will understand how significantly different are the democratic Western society and what the Kremlin's propaganda have turned into the social consciousness in Russia. The search for spiritual sources leads Putin straight to the capital of Ukraine. Can a person with such thinking rest before he can rule Kiev, which is called the Mother of Russian cities? Going deeper to the roots, it is clear that Orthodox Christianity that Putin cares so much about originates from Constantinople. The Duchess Olga, wife of the above-mentioned Vladimir, was baptised there. Who cares that today the city is known as Istanbul. It is another site of spiritual source for Russia and it shall take the city under protection once it is on its two feet. This is not only my sarcasm: Russia entered World War I hoping to win a trophy - the Bosphorus and the Dardanelles Straits which would give control over navigation between the Black Sea and the Mediterranean. In 1914, Russia remembered that Istanbul was the cradle of Orthodox Christianity and used it as the ideological justification for its policies. The people's patriotic enthusiasm was as high as their hatred for foreigners, which is why Petersburg was Russianised and renamed Petrograd. Only three years later, the nation dethroned Papa Tsar, executed all his descendants and started slaughtering one another. Putin's mind strangely manages to link contradictory things: he loves Orthodox Christianity and admires the KGB which persecuted priests; he has called the fall of the USSR a catastrophe, though he received his current powers from the man who destroyed the USSR, Boris Yeltsin, while under the Soviets he was barely a lieutenant-colonel. Further on the road of spiritual sources here comes Jerusalem, the sacred city for all Christians that also merited a mention in Putin's speech. According to the current Russian doctrine, Moscow is entitled to defend Russian-speakers all over the world. There would be a sufficient number of Russian-speakers in Israel if only there were enough power to swallow it. Considerable efforts are put in the attempts to safe Bashar Assad in Syria, the neighbour of Israel. However, things got complicated by the emergence of Islamic State. Its fighters are sending threats to Putin himself and one of their leaders comes from the Pankisi Gorge between Georgia and Chechnya. On the night before Putin's speech, several dozen Chechen fighters invaded Grozny city centre. Chechen President Ramzan Kadyrov pointed out that the the attack was organized from abroad. It is still not clear whether there are links between Allah soldiers of Islamic State and the attack in Chechnya, but it is quite a serious signal to the Kremlin. Although more than a decade ago Putin promised to bring down all terrorists, during his presidency militant Islam spread all over North Caucasus. But the president of the country in free fall continues to declare war on the West. He concluded the annual address with saying that Russia was ready to face any challenge of the time and win it. The worse the situation, the more exalted the words. Sounds like something from the lips of senile Leonid Brezhnev. It sounds like a cry from a man who is afraid of being beaten because he feels weaker. Therefore he is clinging to his fantasy world where he is the knight of light fighting against the elements of dark. Nobody can make such a man change his mind. He can be stopped only by a painful collision with reality.